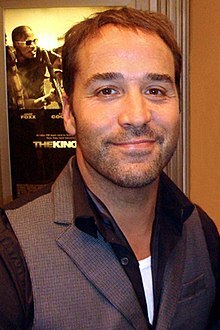 Jeremy Samuel Piven (born July 26, 1965) is an American actor and producer. He is known for his roles as Ari Gold in the comedy series Entourage, for which he won a Golden Globe Award and three consecutive Emmy Awards, and as Spence Kovak on Ellen DeGeneres's sitcom Ellen. Piven also starred in the British period drama Mr Selfridge. In October 2017, Piven was accused of sexual harassment and assault by three women. In January 2018, three more women accused Piven of assault. ↑ Nyren, Erin (October 31, 2017). "Jeremy Piven 'Unequivocally' Denies Groping Allegations". Variety. Retrieved January 29, 2018. ↑ "Exclusive: Three More Women Are Accusing Jeremy Piven Of Sexual Misconduct". Buzzfeed. Retrieved January 29, 2018. ↑ "Jeremy Piven Faces Sexual Misconduct Allegations From 3 More Women". Time. Retrieved January 29, 2018. This page was last changed on 23 June 2018, at 19:05.